Given our current slump this fixture always looked like a tough encounter but it now looks like a massive challenge given the loss of the manager at the start of the week. Much has been said of the “the strength of the dressing room” and that will be given a major test when the players face an on form United side. Kenny Black and Gordon Marshall will have the responsibility for the overall plan but it’s time for the players who have lost five in a row to deliver the performance that’s been missing for so long. The home crowd will be sure to show their appreciation for the Stuart McCall era and we’ll expect the players, many of whom have revealed their debt of gratitude to their former gaffer, to play their part. Team selection is unlikely to be far from that which controlled much of the game in Perth. There were signs of an improvement and if that can be maintained we may take something from the game. Recent history is not on our side. 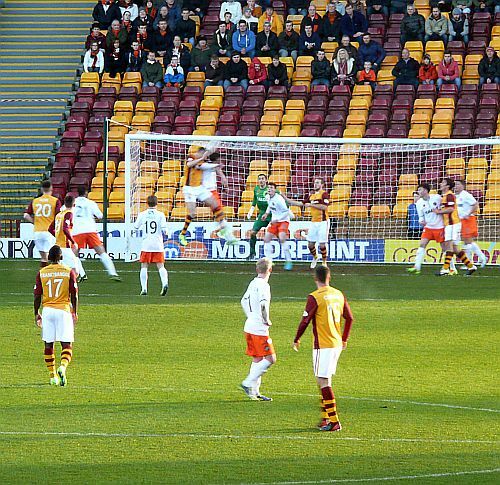 We haven’t scored against United at Fir Park since Murphy and Humphrey delivered a 2-1 win in April 2011. Since then we’ve suffered four losses and a goalless draw. The visitors needed a late wonder strike from substitute Bilate to win the first meeting at Tannadice. Since then they have rattle up the points and now have 8 wins from their 12 league matches. Last week they dismissed St Mirren scoring three without loss. Bilate and Mackay-Steven may be unavailable to McNamara but he’ll have no trouble picking a decent eleven. The reciprocal agreement for season ticket holders will enable visiting fans to see the game for £10 and it is to be hoped that a substantial number travel from Tayside. Motherwell fans will benefit when we complete the return fixture. If this excellent initiative succeeds and spreads we may reverse the long term decline of empty away stands. It may be that the change in leadership provokes a change on the park. If the outcome is a 1-1 draw then both sets of fans may be content.